The currently smallest and lightest professional scanner on the market. Buy the Leica BLK360 from a certified Leica distributor in Bavaria: ArcTron offers the BLK360 with complete accessories and, on request, ready to use with iPad Pro. Your assigned sales engineer will accompany you from product consulting to purchasing, from device briefing to one or more days of training and support. No call center hassle. The highly mobile and easy-to-use scanning system offers excellent scanning characteristics. 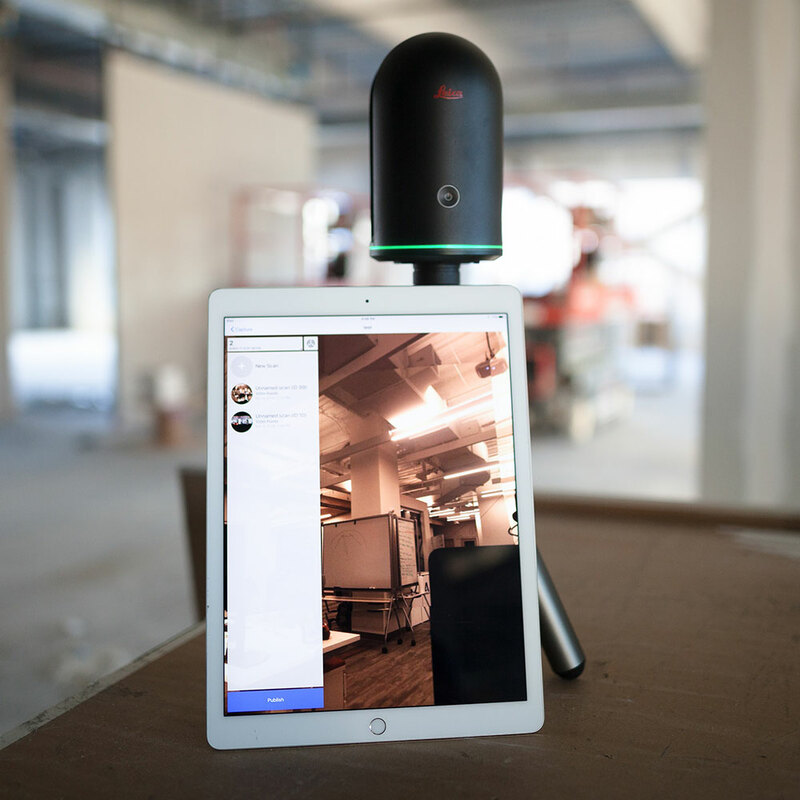 The BLK360 can be used for short-range scanning (1-60m) and in particular for the inventory of buildings and interiors. 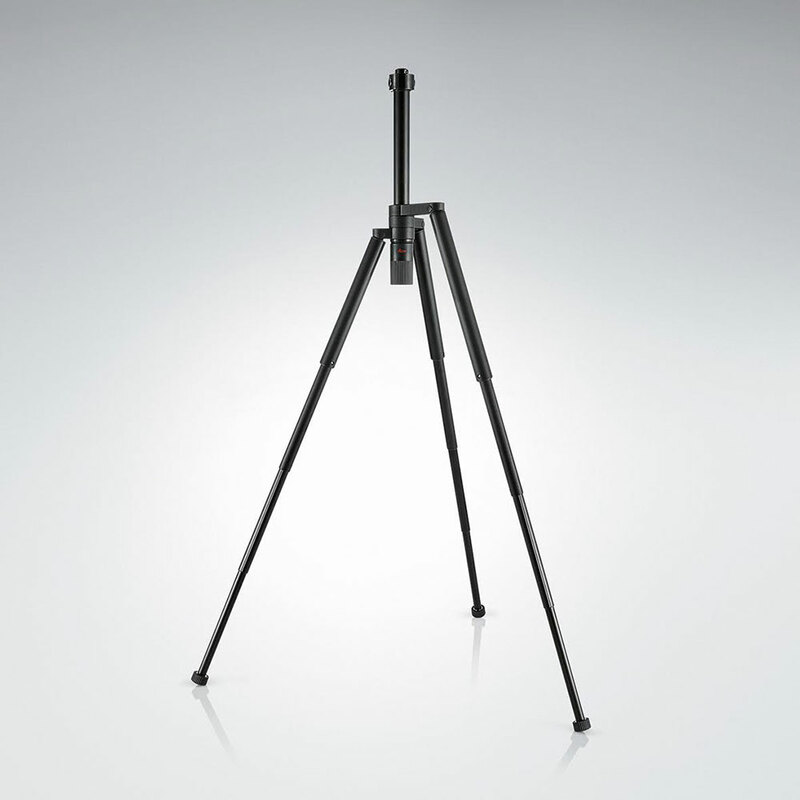 Please ask us about our comprehensive full service for this new product line from Leica and Autodesk. The highly mobile and easy-to-use scanning system has excellent scanning properties. HDR photography, 3D panorama using three built-in digital cameras and the integrated thermal imaging camera expand the application possibilities of your new scanning system. Simple handling and quick familiarisation without previous knowledge! No more question marks in the plan creation! Small and handy in your travel bag! Ask us about our comprehensive complete service for this new product line from Leica and Autodesk. The BLK360 can be controlled via WiFi using an iPad. This requires the Autodesk ReCap pro mobile app. ReCap Pro mobile filters and registers the scan data in real time. 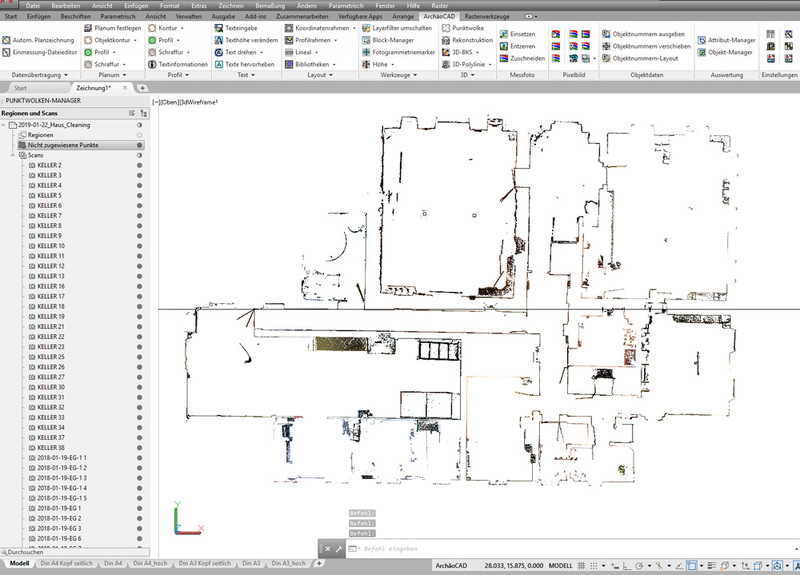 The app greatly simplifies the capture process and provides direct, seamless data output for further processing with Autodesk products. The data provided in this way is then used in CAD, BIM, VR and AR applications. 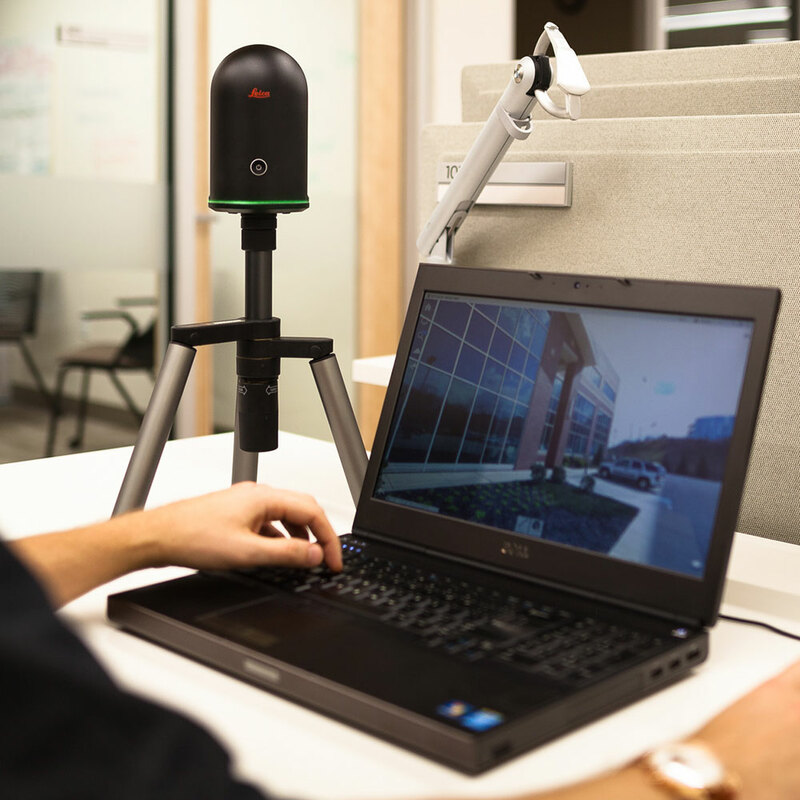 The BLK360 laser scanner calculates XYZ coordinates in 3D by capturing three values (horizontal angle, vertical angle and oblique distance). This is called polar measurement. The 3D point accuracy of a laser scanner is thus directly related to the accuracy of polar measurement. The BLK360 has a 3D accuracy of 6 mm at 10 m and approx. 8 mm at 20 m. This makes the BLK360 the perfect measuring instrument for inventory surveys. 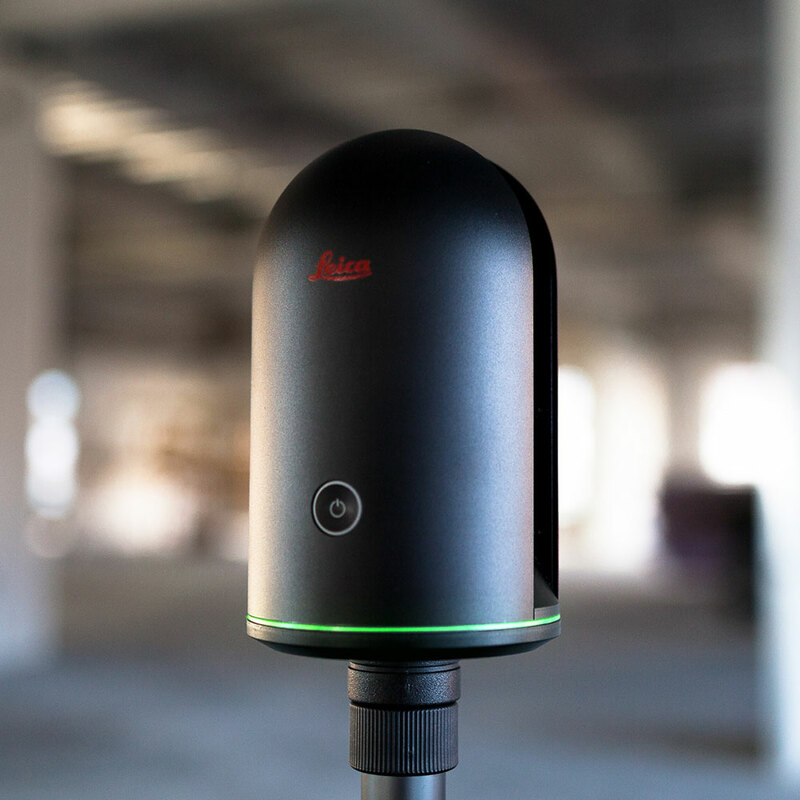 Measuring rate The BLK360 performs up to 360,000 measurements per second. Depending on the task, the BLK360 can be adjusted to capture more or less measuring points per single scan. The scan resolution is comparable to a wine (dot) raster, which is generated on a surface at a defined distance (e.g. 10 m) from the scanner. The number of points per single scan depends significantly on the selected scan resolution, the distance to the scan object and its reflective properties. The measuring range for a laser scanner depends significantly on how reflective the surface of an object is and how far away it is from the scanner. The BLK360 has a range of 60 cm up to 60 meters. As a rule of thumb, one can say that the laser reflects bright surfaces better than dark ones. The BLK360 serves as its own WiFi hotspot, so no WiFi access is required at the point of use to capture reality. The integrated wireless LAN supports the 802.11 b/g/n standards. If you want to use cloud-based collaboration tools (e.g. AutoDesk ReCap pro mobile) on site, you will need Internet access to ensure the functionality of these apps. You can set up Internet access using a SIM card that is inserted into the iPad Pro 12.9″ required for control. For maximum flexibility, the BLK360 can be fully controlled by using an iPad Pro 12.9″. There are currently two apps available for this purpose. You can control the BLK360 with the BLK360 app from LeicaGeosystems and with ReCap Pro mobile from AutoDesk. Both apps enable you to control the BLK360 wirelessly, modify the scanner settings, visualize the scan data (image and point cloud data at runtime) and register the individual scans to form a complete scan. 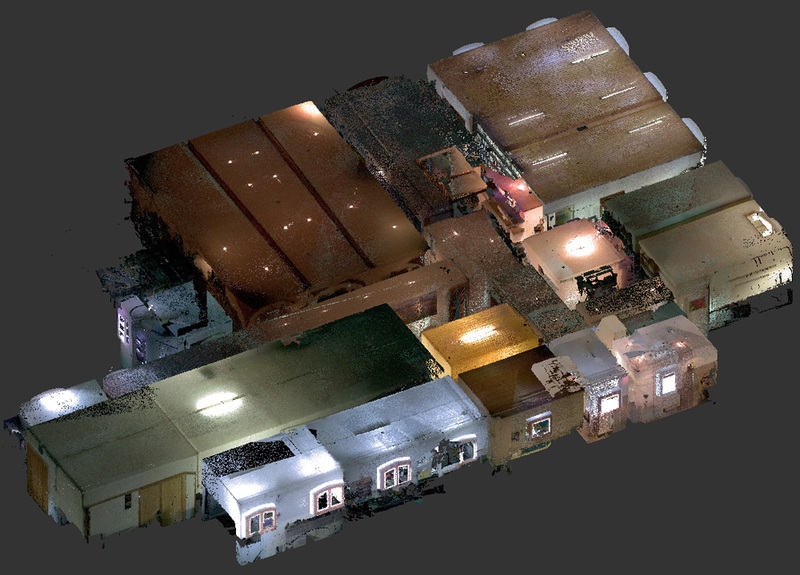 A 3-dimensional point cloud is a point cloud in 3D space that displays a scanned object in correct scaling. Each of these points is determined by a three-dimensional coordinate (X; Y; Z) in its position. In addition, each of these points is given a value for intensity (a measure of reflection) and three values (RGB) as color information. Additional information: Please note that color values can only be determined if the scan also contains image information. The BLK360 has an integrated FLIR® thermal image sensor. In the 30 seconds that the BLK360 captures a spherical HDR thermal image, a 70°V x 360°HZ panoramic thermal image is simultaneously generated. The IR sensor is exactly coordinated with the HDR sensors and the laser scanner. 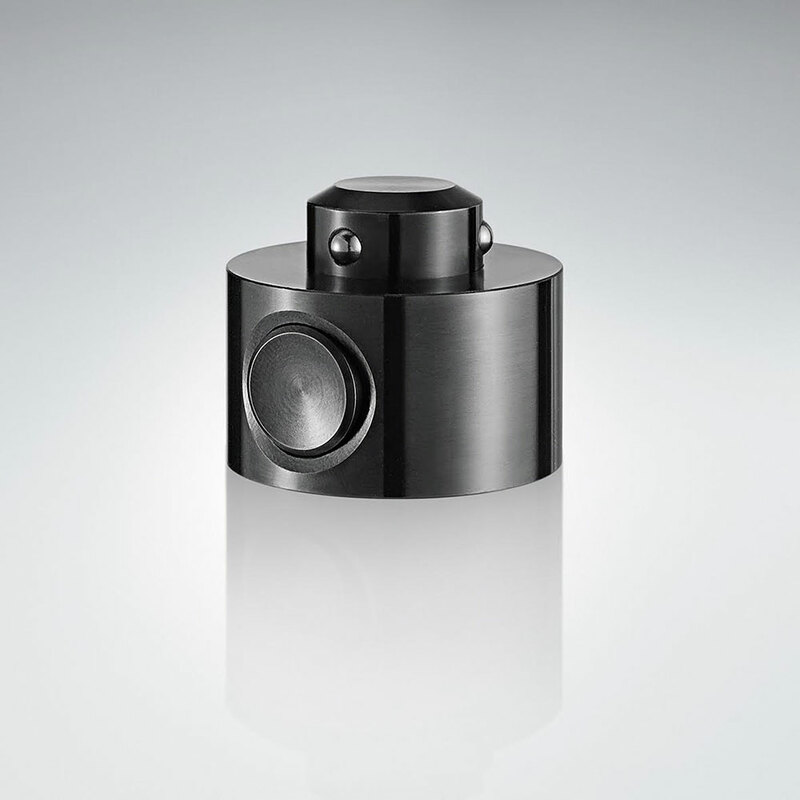 The IR sensor generates a color scale, and is calibrated within +/- 1° C. Thus the BLK is also suitable for realistic gathering of energy levels. The BLK360 has three 5-megapixel cameras. In an automatically controlled recording interval, the BLK360 creates a colored spherical panorama of 360°HZ x 300°V and a file size of approx. 150 MB. Optionally, you can also create the spherical panorama as an HDR panorama. Please note, however, that this leads to an extension of the gathering interval of the panorama images and to an enlargement of the data volume to be processed. Meaning it takes longer to survey and the file size is larger. Scan projects usually consist of a large number of scan positions, which must overlap sufficiently. These single scans have to be merged to a coherent overall scan. This process is called registration. AutoDesk ReCap Pro mobile supports you in this process in the most intuitive way by first trying to register single scans automatically. After each successful registration, the user receives an accuracy summary which he can use to accept the result or register manually. Manual registration is necessary, for example, if scanned structures are too similar. The manual registration is done by visualizing the unregistered scan position to a selectable, already registered scan position of the total scan. Now only 3 identical points have to be picked in both scans. The registration calculation is then automatically triggered and its result visualized. 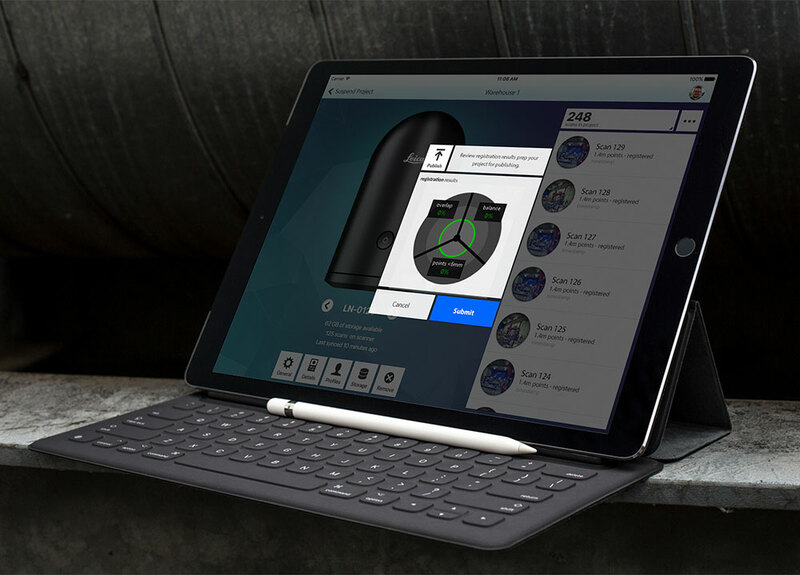 The BLK36 is ready to go, even if you’ve forgotten to charge your iPad Pro. In stand-alone mode, the BLK360 stores up to 100 full reality captures in its 64GB onboard memory: Images, laser point cloud and infrared panorama images. Once connected to an iPad Pro, however, storage space is limited to the size of your tablet. The BLK360 weighs less than 1 kg despite its robust aluminium housing. With a diameter of 100 mm and a height of 165 mm, it is somewhat easier to transport than comparable laser scanners. 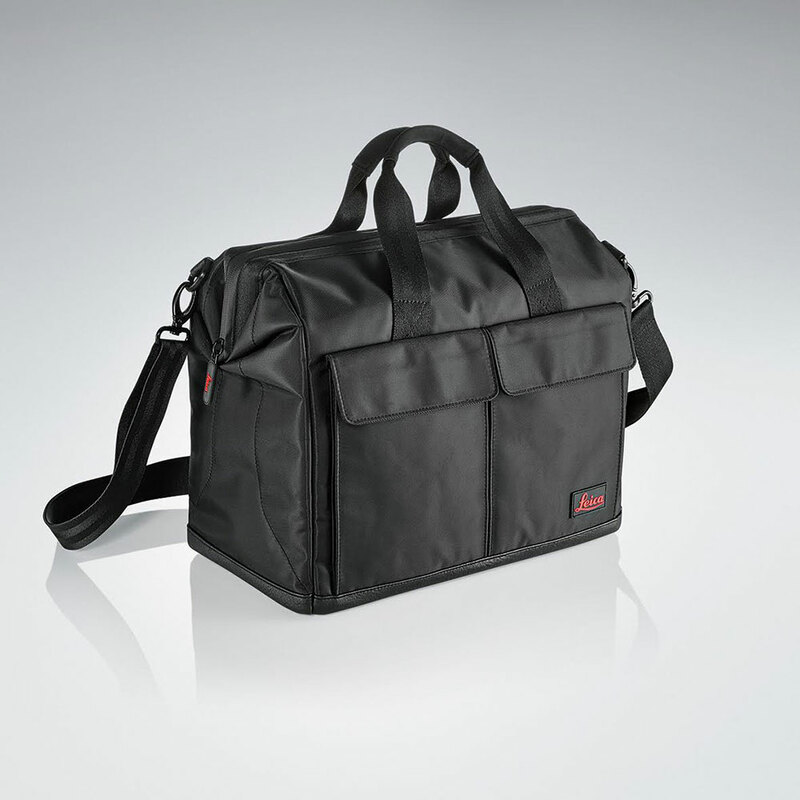 Of course you can purchase original Leica accessories from us, so that you can complete and extend your Leica system in a useful way.